If you need some casual work in Australia while you are travelling around this great land, you should consider fruit picking. You can pick fruit 12 months of the year somewhere in Australia. Our guide will help you find casual fruit picking jobs by advising you of the locations and time of fruit picking in towns or regions of Australia. .
Then you can use the Jobsearch web site to find casual fruit picking jobs in that town or region. 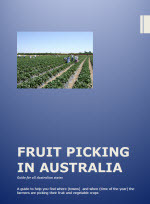 In Australia, the fruit picking season peaks during summer, between the months of December and May. Due to different weather patterns, regions such as Manjimup, Pemberton, and Bunbury in Western Australia hold their apple harvest a bit later between March and May. Payment depends on a number of issues, such as how good the harvest is, and what the particular fruit or produce is. For example, some land owners prefer to pay pickers by the hour (anything above $10 an hour is good), such as vineyards and grape growers, because they want the fruit to remain in pristine condition. Bruising is not an option. Most places, however, pay per bucket, bin or box filled rather than by the hour. Ground fruit Fruit grows on or under the ground. This type of picking can be back breaking as it involves continual bending over to pick the fruit. Tree fruit Fruit is picked from the branches of a tree or plant. Often involves the use of ladders to pick fruit or use of a mechanical boom to pick fruit. Size picking The farmer is looking to pick a particular size of fruit. Usually, picking fruit by size is conducted at the start of the season. Strip picking Usually involves removing all the fruit or vegetables from the plant. Contract Based on the amount of fruit picked by individual pickers. Usually involves collecting fruit in 'buckets' (or bins) and recording the number of buckets picked each day. You determine the hours worked based on the number of buckets you wish to pick. If you are a good picker, contract work is usually the best way to make a good casual wage !